Litigators enjoy trials, or at least they enjoy winning trials. Trial practice is generally known to be one of the more stressful specialties within the legal profession. Within the framework of civil procedure rules and rules of evidence, practitioners understand the technicalities of how to handle a trial. They rely on the rules and procedures to create effective plans to present their cases. It is understood that everyone operates within the rules, more or less, with judges acting as rule enforcers when necessary. However, there is one aspect of trial practice trial lawyers universally dislike: litigating against a pro per. Pro Per is a term derived from Latin meaning roughly “for one’s self,” and is used in the legal-profession to describe a person who is handling their own case without an attorney. Attorneys spend years learning the rules of evidence and procedure; they understand these rules at a cellular level. Every trial lawyer understands the elements of a cause of action, and what evidence is required to prove elements necessary for victory. However, pro per parties rarely know the rules, and if they know the rules, they have difficulty applying them. The lack of understanding wreaks havoc with the well-laid plans of seasoned litigators and all sense of comfort in the process is destroyed. 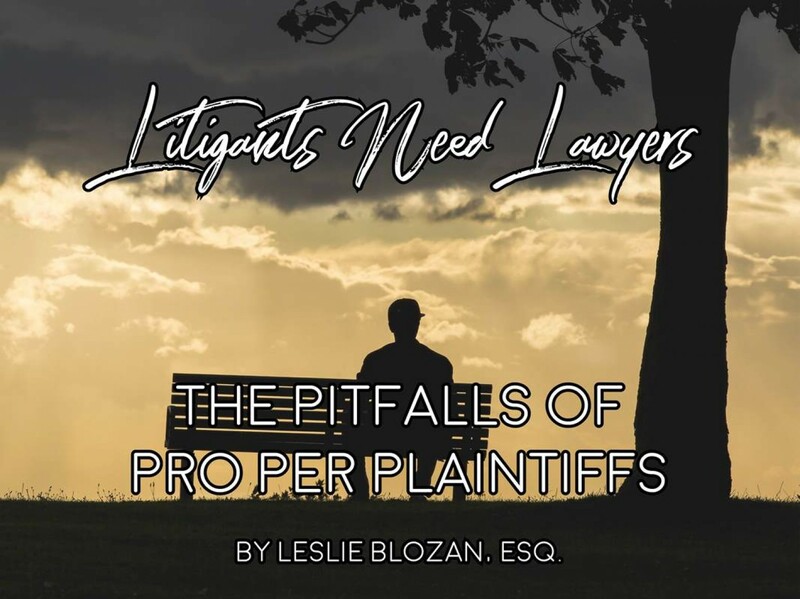 Leslie Blozan was recently faced with the dilemma of an elderly, ill, angry pro per plaintiff who insisted on a jury trial. The plaintiff was intelligent and fiercely tenacious in pursuing her case. She firmly believed that her accident ruined her life. All settlement offers were rejected, yet she refused to make a settlement demand, thereby preventing settlement and leaving trial as the only option. Of course, plaintiff did not know the procedure. She noticed ex parte motions and failed to appear. She did not understand how to prepare the joint trial documents required by local court rules. Ms. Blozan, as defense counsel, had to prepare all necessary documents when plaintiff did not or could not, effectively allowing plaintiff to ignore the rules because everything would be handled for her. Plaintiff was remarkably astute during jury selection. She was able to accurately identify several jurors who appeared favorable to the defense. She exercised her preemptory challenges with confidence. But once trial began, her effectiveness collapsed. Opening statement to the jury was a combination of narrative testimony and argument. Typically, attorneys try not to object during an opponent’s opening, but it this instance it was unavoidable. When plaintiff testified, she launched into a narrative full of hearsay, foundationless medical pronouncements, and argument. There is sometimes a fine line between a vigorous defense and the appearance of beating-up on an opponent, especially when the opponent is inherently sympathetic. At the same time, objections have to be made, regardless of appearances. Plaintiff failed to introduce any documentary evidence, as she did not understand the technical requirements of the process. Her cross-examinations of defense witnesses were further exercises in argument, and often irrelevancy. A key item of evidence was not addressed at all. This evidence, had plaintiff known how to handle it, could have made a difference in the outcome. Closing argument was another example of testimony in the guise of argument, and a cry to sympathy instead of evidence, requiring more objections. After deliberation, the jury returned a defense verdict, 11-1. The verdict was announced; the jurors thanked and excused. As the courtroom emptied, plaintiff sat, alone at counsel table, clearly not comprehending what had happened. After 10 minutes, she stood up and plaintively asked the clerk: “what happens now?” The clerk patiently explained plaintiff lost and the case was over. Plaintiff stood, uncomprehending, trying to grasp the fact of her loss. She then packed her documents and left the courtroom. As Ms. Blozan left the courthouse, she saw the plaintiff speaking with two jurors. The jurors were trying to explain why they voted as they did. Plaintiff’s usually combative demeanor had changed to one of confusion. Trial victories are usually sweet. This one was bittersweet. Plaintiff was a worthy opponent, for all of her inexperience. With or without an attorney, she did not have a good case and should have lost. As a person, she was sad: elderly, in poor health, with personal tragedy in her life. Although winning was bittersweet, losing would have been simply bitter. The moral of the story is that litigants need lawyers. Ms. Blozan’s unfortunate plaintiff could have received some compensation, if she had an attorney to represent her and explain why her case was weak. She could have scored a moral and financial victory in mediation. Instead, she was ruled by her emotions, and without effective legal guidance, lost every possible advantage.